Is there any scope for political consideration? "There is no better test of the excellence of a government then the efficiency of its judicial system, for nothing more nearly touches the welfare and security of the average citizen than his sense that he can rely on the certain and prompt administration of justice....," says James Bryce. [Bryce, James, Modern Democracies (19290), P.384. In the hierarchy of our judicial system, the office of the Chief Justice is in the top. The appointment of the Chief Justice is made by the President as per Article 95 (1) of our constitution. To state more clearly, in this matter of appointment the President don't have to consult with the Prime Minister and this has also been stated in the Constitution in Article 48(3). Despite this constitutional provision, government's influence in the appointment to this post has now become a common phenomenon. Although appointment is made by the President, political consideration and influence of the government play an active role behind the scene. The Constitution says nothing about whom the President will appoint as the Chief Justice among the judges of the Supreme Court. No constitutional obligation has been conferred on the President in this regard. He can appoint any judge of the Supreme Court to this post. But it has become a constitutional convention that the senior-most judge of the Appellate Division is to be appointed as the Chief Justice, whenever the vacancy occurs in that office. There has not been any breach of this convention till 1996, when the caretaker government system was introduced in our Constitution. 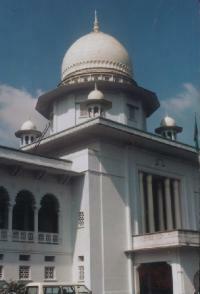 Though former President Ershad made an attempt to supersede Justice Sahabuddin Ahmed when the then Chief Justice BH Chowdhury retired but by the continuous boycotting of court by the lawyers, Ershad was compelled to appoint Sahabuddin Ahmed as the Chief Justice of Bangladesh. Now the matter of maintaining seniority in appointment of Chief Justice has become vitally important as the immediate past (last retired) Chief Justice is to be appointed as the Chief Advisor of the caretaker government as per Article 58(c) of the Constitution. For this constitutional provision, recently a tendency is seen within the government to appoint a judge (of their choice) as the Chief Justice of the highest court without considering the question of seniority and by-passing the senior most judge. It is pertinent to mention here that no breach of any law or rule takes place if a judge superseding his senior is appointed as Chief Justice as law nowhere binds or stipulates that senior-most one should be the Chief Justice. This may well be the legal argument of those who support such an appointment, but if we ponder to the political consideration of the government behind such appointment, the argument will take a different shape. Now a days before appointing the Chief Justice the government think and consider of who will be the last retired one to become the chief of caretaker government. This is the true political point which is considered recently in the appointment of Chief Justice. This political influence will definitely strike the impartiality of our highest judiciary which will have a negative impact over the administration of justice. This tendency of violating of the seniority in the one hand will create resentment among the senior judges and on the other hand will undermine the independence and impartiality of the judges. At the same time it gives an opportunity to the opposition parties to assert that the government for their benefit at times of general election has appointed a Chief Justice of their own choice who by turn will be the Chief of the caretaker government as last retired Chief Justice. Thus a question as to the impartiality of caretaker government may also be raised. Although the maintenance of the seniority convention is a mechanical rule, it is beyond controversy, as none can raise any question as to such appointment. If there is any scope of personal favoritism and political consideration in appointments, there remains a possibility of administering justice in a partial way resulting in low and undermined quality of judgement. Ultimately this will led the people to withdraw their confidence from the judiciary. Now it is the utmost duty of the government to ensure the impartiality of the judiciary, especially highest judiciary. This can only be done by keeping the judiciary beyond any scope of controversy. The bulk of responsibility rests on them to place the judiciary beyond any scope of criticism. They should let the appointment of the Chief Justice be taken place as per the convention i.e. the senior most judge of the Appellate Division should be the Chief Justice. Only then the excellence of the government in running efficiently its judicial system will be proved. Shiffat Sharmin is a Lecturer, Department of Law, University of Chittagong.